Pianist Don Friedman passed away on June 30. 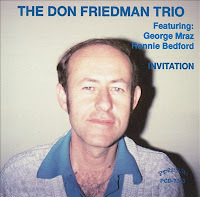 As well as leading his own small groups, Friedman played on many albums with other luminaries such a Buddy Colette, Joe Henderson, John Handy, Clark Terry and many others. Influenced very much by Bill Evans, Friedman was, nevertheless, his own man. This obituary come interview on Jazzwax gives an insight into the man.